Production of this legendary fromage ceased for a time following the Second World War, but was revived in 1956 by Robert and Simone Berthaut, who founded Fromagerie Berthaut in 1956 to employ those who still possessed the traditional skills and knowledge to produce it. Never dreaming that this would be the start of the spectacular renewal of this ancient cheese, the fromagerie is now operated by their son, Jean Berthaut. 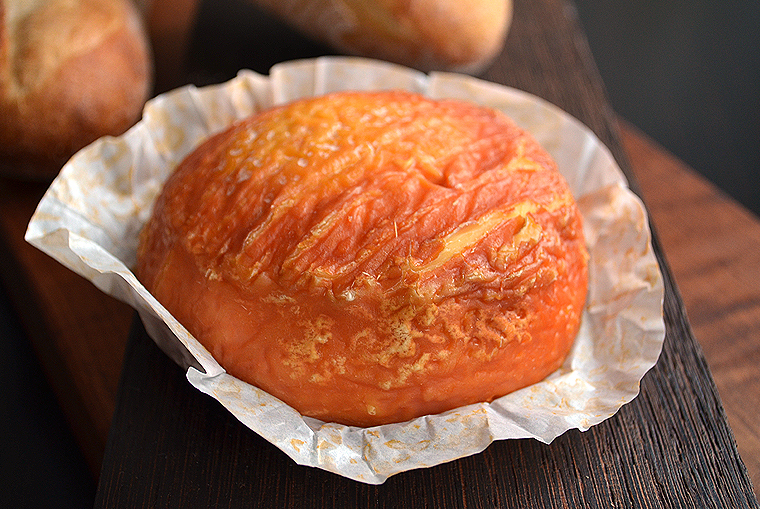 Époisses is a pungent, unpasteurized cows-milk cheese which is washed in Marc de Bourgogne, the local pomace brandy. These small circular wheels have a soft, dark orange exterior, and arrive packed in a wooden box. 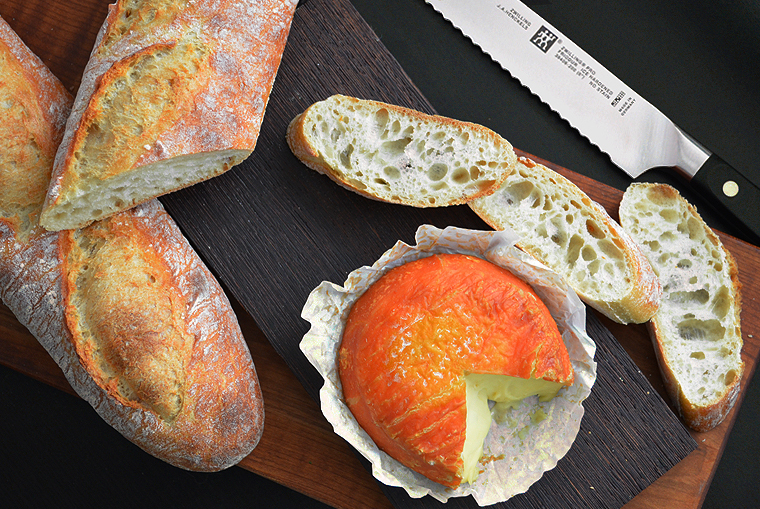 The cheese is often served with a spoon due to the extremely soft texture. 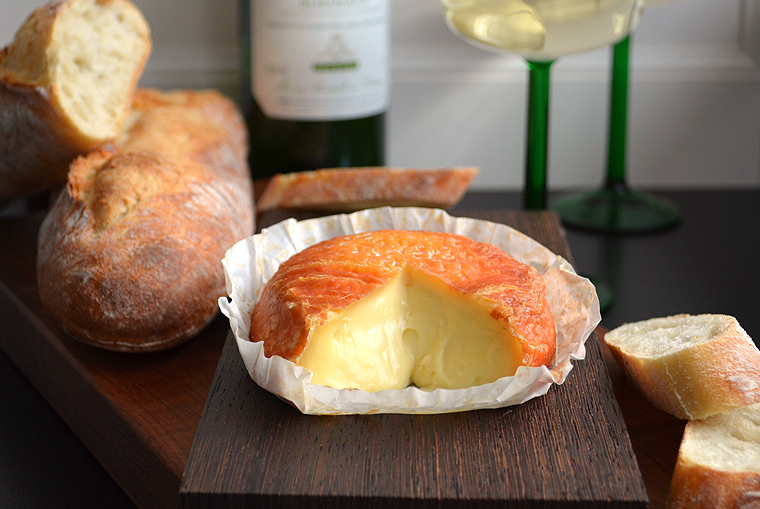 This cheese is often served with a sweeter wines, which enhance its character. 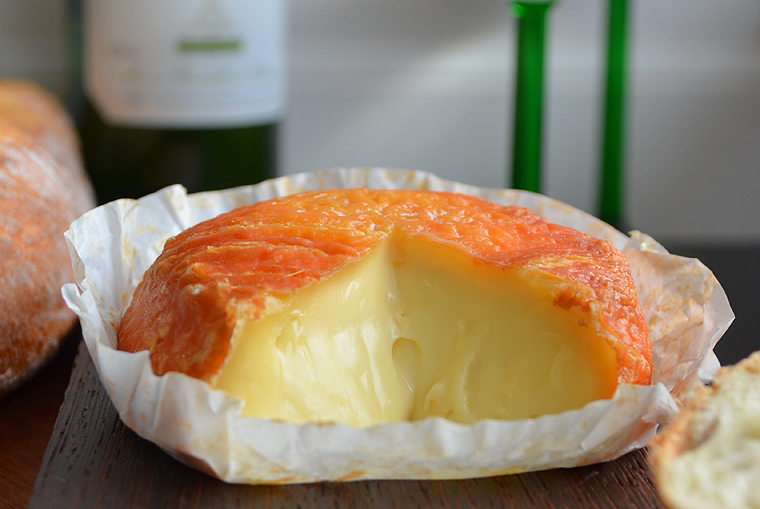 In 1991 Époisses de Bourgogne was awarded an Appelation of Origine Contrôlée (“AOC”) Protected Designation Origin, ensuring consumers a quality product of guaranteed origin and tradition. Although originally intended for the French palate, it is now exported worldwide, with distribution as far away as Shanghai! 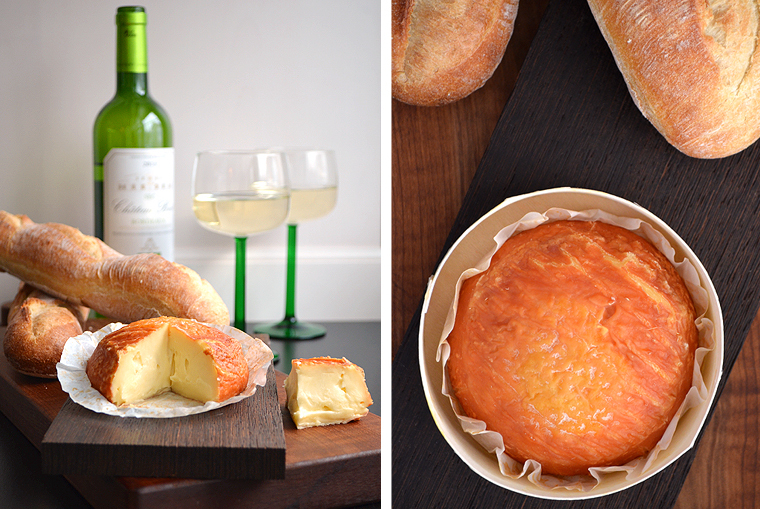 I chose to pair Époisses Berthaut with one of my favorite white Bordeaux wines and warm baguette, although a good Champagne, Gewürztraminer d’Alsace, or a Bourgogne Blanc would also pair nicely. I find great comfort in the fact that although I left much of the great European cuisine behind when I moved back to the states, I can still enjoy some of my favorite cheeses right here at home. 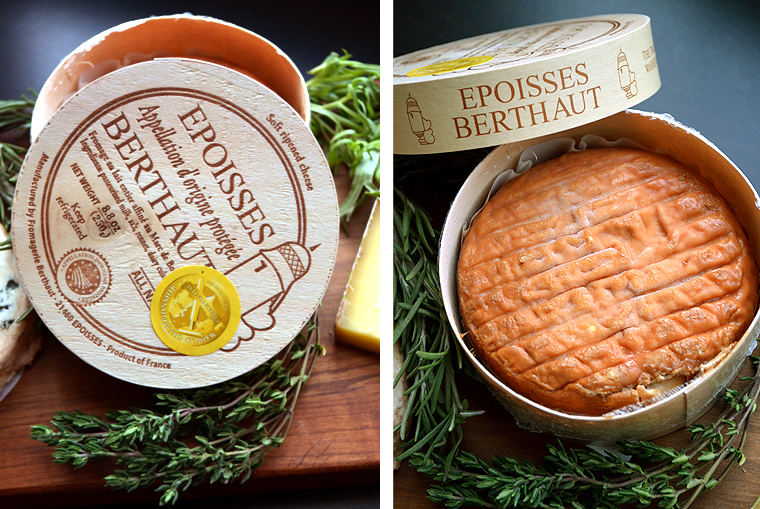 You can purchase Époisses Berthaut and other imported French cheeses from the French Cheese Board and at many retailers. The Cheeses of France Marketing Council: Composed of French dairy farmers and cheese firms, the Council is led by The French Dairy Inter-Branch Organization (CNIEL) and their mission is to create awareness on a variety of cheeses of French cheeses that are available here in the US and around the world. 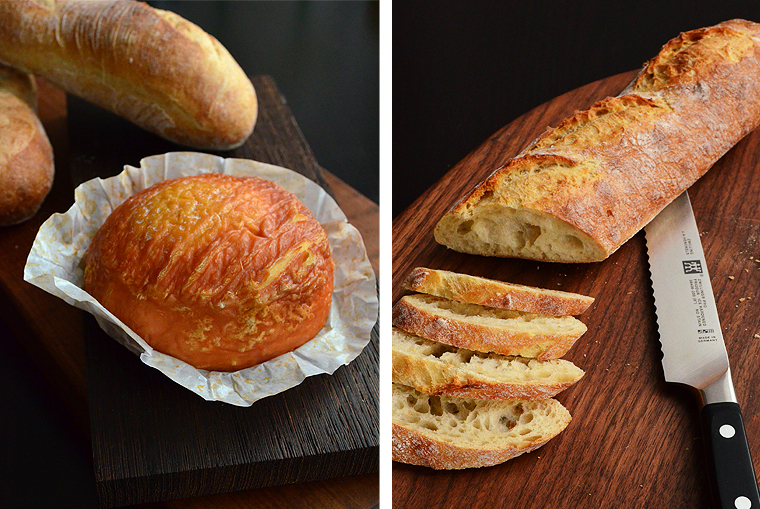 They are helping and teaching Americans how to incorporate French cheeses into their diets, lifestyle, and recipes. Their marketing campaign is financed with the support of the European Union. To learn more about Époisses Berthaut and other French cheeses please visit The Cheeses of Europe. This entry was posted in Recipes and tagged Appelation of Origine Contrôlée, appetizer recipe, artisan, artisan cheesemakers, Époisses, Époisses Berthaut, Époisses cheese, baguette, cheese, cheesemakers, European cuisine, france, french, French cheese, French cheese in USA, French cheese paired with champagne, French cheese paired with wine, Fromagerie Berthaut, Jean Berthaut, Marc de Bourgogne, Pomace Brandy, Robert and Simone Berthaut, The Cheese of Europe New York, The Cheeses of Europe, The French Cheese Board, Where can I find French Cheese in the States, White Bordeaux wine. Bookmark the permalink. This looks really amazing! I’m definitely going to add it to my must-try cheese list.